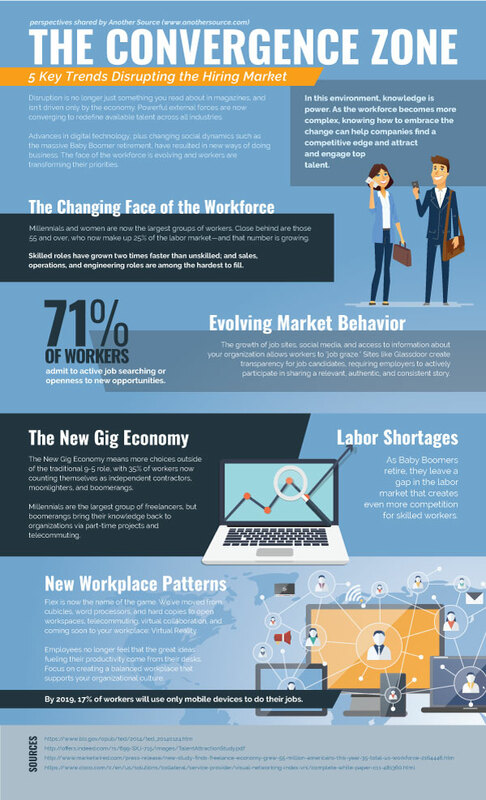 Virtual reality, the gig economy, boomerangs, telecommuting: These are just a few of the trends that are forcing all of us to change the way we recruit, hire, and retain talent. In this new hiring market, knowledge is power. At Another Source, we aim to be your go-to source for recruiting information, tools, and strategies. That’s why we recently mentioned that we would be starting a three-part series highlighting key trends we’re seeing in the market, with tips to help you be as prepared as possible. The Convergence Zone: 5 Key Trends Disrupting the Hiring Market.